This is an image of on-going process on a really interesting project, a departure from large, mountain houses. This is a small, simple house centered around a beautiful existing ash tree on a property south of Loveland, Colorado. Using the tree as the organizing center, the house arrays itself around a courtyard, using the tree as the barometer of the seasons, providing shade in the summer, revealing mountain views in the winter. 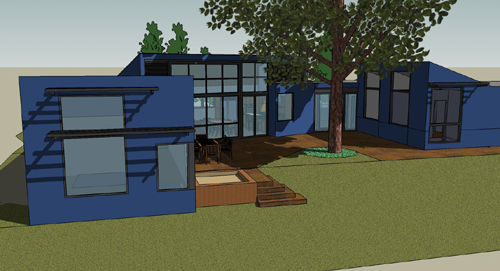 A new project we are working on is a single family house located on a beautiful, west-facing site south of Loveland, Colorado. The site slopes down from east to west and has a spectacular view of Longs Peak and the Continental Divide. This photo is of an initial physical model of the design depicting the basic massing of the proposed house arrayed around a large existing ash tree. Providing summer shade, the tree serves as a functional sunshade as well as creating the focus of an outdoor room, with its canopy creating a leafy ceiling of filtered light.